Daniel K. Inouye International Airport Your car can pay for your parking space. Honolulu Airport Parking : Cheap parking in a busy airport is the best gift to a car owner or a traveler leasing a ride. Realize a flawless travel experience when you book with TravelCar to access cheap parking, affordable valet services and fantastic deals on our ride-sharing facility. TravelCar is present in the State of Hawaii and serves travelers moving in and out of Daniel K. Inouye International Airport. The firm also aids passengers from local seaports, train stations and hotels. Additionally, with our leased rides, you can visit local tourist attraction sites and nearby business districts. TravelCar Rentals and Ride-sharing facility avails cheap parking solutions to travelers flying in and out of Daniel K. Inouye International Airport. Daniel K. Inouye International Airport is also known as Honolulu International Airport. The airport was built in Honolulu in the year 1927. HNL is owned by the State of Hawaii and operated by the Department of Transportation. Honolulu airport serves the Island of O’ahu and Honolulu in the State of Hawaii, United States of America. 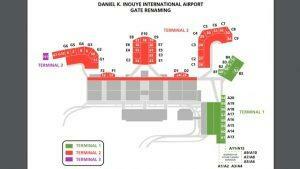 Daniel K. Inouye International Airport is 5 kilometers North-West of Honolulu city center. Daniel K. Inouye International Airport acts as a primary hub for Transair cargo, Asia Pacific Airlines, Aloha Air Cargo, Mokulele Airlines, and Hawaiian Airlines. It has two offshore runways and four paved runways. The main terminal buildings are three in number. 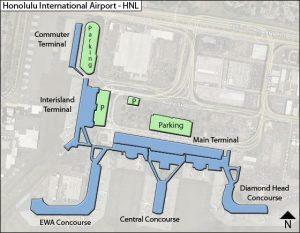 HNL is the primary aviation gateway of the County of Honolulu on Ohau in Hawaii State. Aviation services are handled on the South-Eastern side of the airport. Daniel K. Inouye International Airport experiences the highest passenger traffic among all busy airports in Hawaii. It rivals Hilo International Airport, Lanai Airport, Lihue Airport, Kahului Airport, Molokai Airport, and Kona International Airport at Keahole. The airport is 28th on the list of the busiest airport in the United States of America. Significant cities surrounding Daniel K. Inouye International Airport are the cities of Ewa Beach, Ahuimanu, Waipahu, Makakilo, Lanai, Makaha, Nanakuli, Pearl City, and Kaneohe. Other cities in Hawaii that are 69 miles from Honolulu are Aiea, Kailua, Wahiawa, Mililani, Waimalu, and Waianae. The Cell-phone Waiting Lot is situated at the Ewa Service Road A. It allows free parking to drivers awaiting clients up to a maximum of one hour. Electronic Vehicle Parking is accessible on Levels 7, 8, 1, 6 and 5 in the International Parking Garage. The eight-storey International Parking Garage is based across the International Arrivals section. The garage is usually open at all hours daily but has a parking limit of 30 days. Terminal 1 Parking Garage is located next to Terminal 1 in a seven-storey building. It has a parking limit of 30 days and is open 24/7. The Terminal 2 Parking Garage is across Terminal 2 and has a parking limit of 30 days. It is accessible all days of the week at all hours of the day. The garage is housed in a five-storey building. A frequent traveler should consider exploring traveling options to minimize cost and at the same time get a convenient means of travel. A car rental is a valuable asset to a traveler looking to exploring a given area without having to worry about strict timelines. It is in this regard that TravelCar presents vehicles for hire to passengers flying in and out of Daniel K. Inouye International Airport. Aside from offering car rentals to travelers, TravelCar has the best ride-sharing arrangements in the region. You also get to occupy cheap parking spaces under the management of TravelCar. If you love the services of a valet, you can request for valet services prior your arrival at the airport. Our able valet team is available at all hours of the day, throughout the week. We propose a ride-sharing deal to travelers who will be away on their trips for a long time. The ride-sharing agreement comprises of monetary compensation for mileage covered and covering insurance and general service costs. Once your ride is parked, you can hitch a ride on our free shuttle service to your specific terminal of departure. Our shuttles frequently leave the terminals and only take about five minutes to the terminals. The booking process is officially carried out of our website www.travelcar.com. On the site, you can request a quote and proceed with the booking. Do you need hotel services and conference rooms? Get a car rental from us and drive to some of the closest hotels to Honolulu International Airport. Terminal 2 (The Main Overseas Terminal) Central Concourse: gates 14-23 (E1-E10). Diamond Head Concourse: gates 6-11 named G1-G6. Ewa Concourse: gates 26-34 named C1-C9. Selecting TravelCar as a travel partner will be the best decision you will make on your journey. It is a top-rated brand by TrustPilot. This is because, this firm gives you a wholesome package from car rental delivery, affordable valet services, cheap parking, ride-sharing service to full-time customer support. With a car rental, you become self-reliant by driving yourself to and from an airport. Avoid interfering with the schedules of close friends and family. Just get a car rental from us from any city, train station, seaport or hotel to Daniel K. Inouye International Airport. It is cheaper using a car rental from us than owning a car in a big city. We take care of major insurance costs and cover other car maintenance fees through our vehicle maintenance program. Save cash by leaving your guzzler at home and selecting a car rental with minimal fuel consumption. It is also cheaper to pick vehicles with large passenger capacity when traveling in a group. Move around the State of Hawaii with ease at any given time of the day or night. The freedom you get with a TravelCar ride allows you to explore the exciting sites and features in Hawaii. TravelCar has a variety of vehicles under its listing. You can get Sports Utility Vehicles, minivans, saloon cars, station wagons and many other car types to suit your occasion. Variety is good regarding making an impression to people in special functions. Sometimes it is about the functionality regarding fuel consumption, terrain, luggage type and size, and the number of travelers. Quotes are easily accessible online on our website www.travelcar.com. Since many of our parking slots are offsite, you can have peace of mind that accessing your vehicle will be a manageable task. We service vehicle to ensure that the brakes and tires are in order and also change the oil if need be. Car wash services are also available at our parking spaces. Our parking solutions are for both long-term and short-term parking. Valet services boost your travel experience in many ways. A valet assists you in parking your car in a fast and efficient manner. You also get curbside assistance with your luggage. Upon your return, a valet is responsible for bringing your car to you. Our valet prices are very reasonable. Remember, our customer service team is made up of professionals who are willing to assist you at any time. Customer support is open 24/7 throughout the year. Reach out to TravelCar at any time, and we will be at your service. Road TheBus TheBus uses routes 19 to link Hickam Air Force Base to the airport on the Westbound route. On the Eastbound route, TheBus reaches Kalihi Kai, Downtown Honolulu, Ala Moana Shopping Center, Honolulu Civic Center, and Waikiki. Route 20 connects Pearlridge Shopping Center, Aiea, Arizona Memorial, and Aloha Stadium to the airport via the Westbound route. On the Eastbound route, TheBus connects Ala Moana Shopping Center, Downtown Honolulu, to HNL airport. Route 31 links the airport to Tripler Army Medical Center through Kalihi Transit Center. Routes 40, 40A, 62, 42 and 9 connect the airport to Downtown Honolulu, Waikiki and Moana Center. As a traveler in HNL airport, you can expect to find restaurants, medical services, wheelchair services, shopping centers and ATMs. There are conference rooms for holding meetings within the airport.